I didn’t graduate from high school dreaming of becoming a winemaker. In fact, I never really drank wine until I was in my 30s. That is probably normal for a guy from the rural Midwest. I met my wife Sandi in college, and she was an eye-opener for me. Through Sandi, I learned about the importance of wine in Italian cuisine and culture. Her grandmother Angelina was well into her 90s and always had a glass of red wine with dinner. Her grandfather always made wine at home, even during prohibition. Wine was an integral part of meals and life, and it enhanced them in so many ways. A glass of wine with your meal encourages one to slow down and appreciate the meal and the company. After an introduction to home winemaking in Nonna Angelina’s basement in 1979, there was a visit to Italy for a cousin’s wedding with home vineyards, and of course, homemade wine. It was after this visit that we made our first wine in our home in 2006. As our children were leaving the nest, there was time in the schedule to start a new hobby and we did. Our home winemaking started with a kit wine in 2006 and grew every year for a decade, becoming a winemaking “school” with over 20 families. 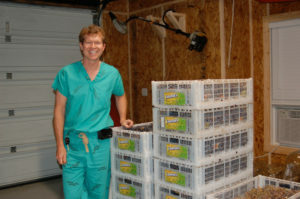 In 2007 I got my first shipment of fresh grapes from Lodi, CA and by 2010, I was organizing a fresh wine grape purchase for the entire Atlanta area. There is so much to learn about winemaking, and I loved blending the art and science (or enology) of winemaking. Like any good hobby, there is no end to the gadgets and equipment needed. In time, I had the equipment of a small commercial winery in my basement. We went to conferences, we experimented to develop our skills and we researched to better understand winemaking. We made many award-winning wines as well as a few mistakes, and all of them were learning experiences. In 2010 I learned that a friend of mine, Carl Fackler, and his wife, Carla, were planting a vinifera vineyard in northeast Georgia. Sandi and I made a few road trips to help them plant the vines in the spring and harvest the grapes in the fall. Our hobby was growing into a passion and a daydream. We wondered what it would be like to have a vineyard and commercial winery. More travels to Italy, France and California led to more knowledge, questions and desire. I was intrigued by the challenge of crafting a truly memorable wine. After succeeding at a few wine competitions, we decided to learn how wine competitions are judged, and we became American Wine Society certified wine judges. That really helped us understand why a wine “tastes” like it does, how to describe wine, and how to recognize a well-made wine even if it is a variety I might not prefer. I came to appreciate how complex a glass of wine can be, and how it expresses the grape, the terroir and the winemaking technique. A winemaker and grape grower can affect a few variables, but a lot depends on mother nature. When all these elements come together in balance it can be amazing. I love the challenge of trying to blend all the elements together in the perfect balance- fruit, flavor, sugar, acid, tannin, alcohol and body. Have you ever had a glass of wine that is so good, so perfectly balanced that it makes you stop and think about the beauty and complexity in the glass? For me it’s like when you are snow skiing and stop at the top of a mountain to appreciate the view and how lucky you are to be there. It makes you sit down and think to yourself how incredible it is. Like a beautiful, emotional song performed perfectly, but it is in your glass. Now we are living our dream that started as a hobby. We have a vineyard and winery, and we want to make excellent, perfectly-balanced wines. There is always something new to learn, and growing vinifera grapes in Georgia will be challenging. 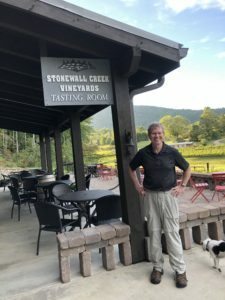 We hope to share our passion and our knowledge of wine with others at Stonewall Creek Vineyards. We believe if we make exceptionally good wine people will come, and the word will spread. Sandi and I have big footsteps to follow in the path the Facklers set. We intend to continue their excellent grape growing and wine making techniques and tradition. If we have half as much fun as they have had over the last decade then we will have been truly blessed.